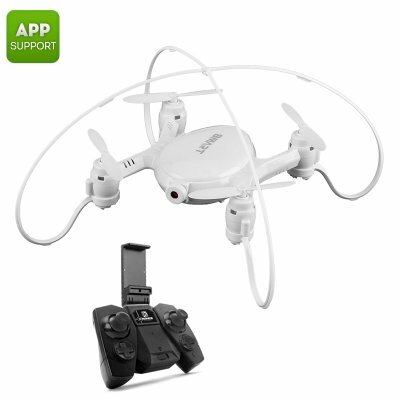 Successfully Added Mini Drone SMAO M7S - 100m Control Distance, FPV, 0.3MP Camera, WiFi, 380mAh Battery (White) to your Shopping Cart. Perfect for advanced drone pilots and beginners alike, the SMAO M7S Mini Drone lets you take off and fly through the skies at an affordable price. With its built-in 0.3MP camera, this Quad-Copter allows you to shoot great pictures and video from above – providing you with an entirely new perspective of the neighborhood. The drone comes with an abundance of nice little in-flight features such as one key take-off and landing settings – making it extremely easy to operate. Guaranteed to bring along countless hours of fun and entertainment, this portable mini drone is the ultimate electronic gadget for young and old. Featuring a strong ABS body, the Quad-Copter has been designed to withstand a hit. Thanks to its compact design, it is extremely portable and has a high maneuverability in the skies – allowing you to fly with this mini drone both inside and outside. With its 100m range, you’ll be able to take off and fly remarkable distances – providing you with a great opportunity to shoot aerial drone photographs of all that lies ahead. A sophisticated 380mAh battery that can be easily replaced makes it possible for the drone to fly up to 7 minutes in a row. When paired with your FPV goggles or smartphone, the SMAO M7S RC Drone provides you with smooth and high-end first person footage while in-flight. From now on you’ll be able to take off and undergo a true first person drone experience. Thanks to its 4 channel 2.4GHz WiFi control, all your recordings and pictures can be shared instantly with your smartphone when using the dedicated mobile application. Compactable with the majority of iOS and Android smartphones – the chances are high that this mini drone works perfectly with your mobile device.